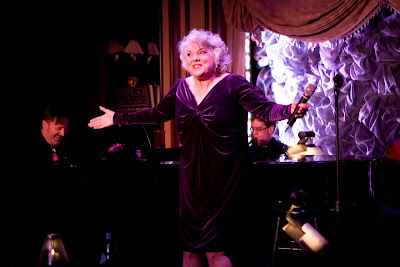 This week, Tyne Daly embarked on her second round of cabaret at Feinstein's at the Regency. Aptly titled The Second Time Around, Tyne's show is a travel through time - both in song and experience. Having enjoyed Tyne's show there last May and wanting to share Feinstein's with my mother, I jumped at the opportunity when I was invited by Feinstein's to see her on Tuesday night. With a delicious combination of warmth and drollness, Tyne took us on a 90 minute journey celebrating the 10th Anniversary of Feinstein's and glimpses into her own life. She found opportunities to share a song from the 13th century to tunes all the way up to the 1970s, one moment having us cheer along with her cheerleader fantasy and the next knocking us dead with her French cabaret singer fantasy. Every bit of repartee lead to song choice that thrilled. She's a bit of a song collector and historian and seems to revel in the obscure. She ended her set with a medly of songs from Jerry Herman's Dear World. She said, "If I were running the zoo, I would mount a production of Dear World." Indeed, she already has the part nailed and we'd be the lucky ones. Tyne is one of those actresses who sings, therefore turning each song into a highly satisfying mini drama or comedy as necessary. She is a mesmerizing performer and she fairly sparkles with her silver hair and mischeviously inviting smile. Tyne is accompanied by John McDaniel, who is leading a quintet that keeps up with her musical journey with no small amount of humor and voracity, jumping genres easily. Tyne appears through Saturday night, January 30th at Feinsteins' at the Regency, Park Avenue at 61st Street. Tickets can be purchased online or by calling 212-339-4095. The cover is pricey, but worth it for this distinctly classy New York venue.